If you’ve ever wondered about meditation, or have become slack in your own meditation practice, I encourage you to join me and sign up to Mindful in May. Mindful in May participants are encouraged to meditate every day for the 30 days in May. Just like exercise, developing the mind’s capacity to stay present and mindful is a skill that requires regular training. By commiting to meditate for just 10 minutes a day for 30 days, you are moving towards developing the habit of creating mindfulness in your day, every day. By registering you will receive daily instruction in meditation, access to inspiring information and research and weekly guided audio meditation downloads. Mindful in May is also raising funds to support Charity Water, a non-profit organisation bringing clean, safe drinking water to the nearly 1 billion people who struggle daily without it. 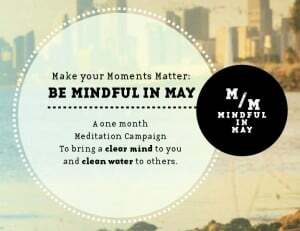 By signing up to Mindful in May you are invited to make a donation to Charity Water. You may also wish to share your fundraising page to raise more money for this excellent organisation. Go to www.mindfulinmay.org for more information.